UNIX Internet gateways and Linux workstations. In Dr.Web for Unix Mail Servers, a malicious file's hash sum is used to detect zero-day threats. Mail and Internet traffic are filtered with the help of the rules you specifically need — including through the use of external data and regular expressions. The modern 64-bit engine detects all security threats. 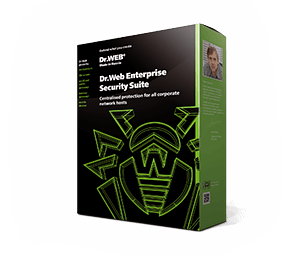 The data in Dr.Web Cloud is used to identify threats that are unknown to the uploaded virus definitions. The system can be controlled both from the web interface and via the command-line utility. Parameters can be configured in the centralised control-system configuration area. Individual settings for different operating system areas in Dr.Web for Unix servers. Custom scanning only for data that interests you. Real-time log control — only the data your company needs is displayed. Transit traffic scanning with Dr.Web for Unix Internet gateways. Fast and secure remote file scanning — without transmitting your data. Anti-virus scanning for external devices, using the telnet protocol. Improved security of memory-based anti-virus components. The use of the insecure TLS1.0/TLS1.1 protocols is rejected. Quick updates — even on low bandwidth. Caching of information about file scanning. Access the history of detected threats at any time. Information about them is now stored permanently. New advanced security mode: data cannot be accessed while it is being scanned. The download speed is not lost even with a large number of users. Mail scanning with an external filter connected to a mail server, a transparent proxy or an SMTP proxy. The external filter mode is available with all mail transfer agents.